In a Nutshell: Relying on travel rewards, miles, and points can be an effective way to save money on your trip. But the process can also be daunting, especially when you aren’t sure how the complex programs work or the best ways to accumulate rewards. 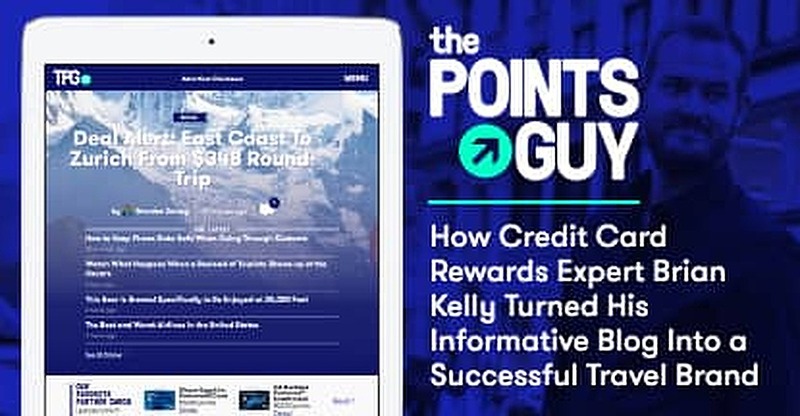 The Points Guy, launched by Brian Kelly in 2010, has the resources travelers need to make informed decisions that maximize savings by teaching them how to utilize credit cards, rewards programs, and points. The site produces original content daily, including detailed reviews, deal alerts, and guides for both novice and experienced travelers. With advice from The Points Guy, vacation planning can turn from a stressful task into a fun search for savings. Keeping up with the latest offerings in airline miles, points, and rewards can be a great way to save money on travel, but it’s also one of the least enjoyable parts of planning a trip. Even selecting a destination can be stressful since it’s hard to know if a deal will also deliver a great experience. While traveling up to six months at a time on business, Brian Kelly found it necessary to learn the ins and outs of travel rewards programs and credit card points. Before long, his rewards and points weren’t just supporting his business trips — they were financing trips to exotic places. In 2010, he decided to launch The Points Guy to share his expertise and creativity with others. The site has since grown into a thriving lifestyle brand that serves 3.5 million new visitors a month and produces between 10 and 20 daily articles that cover the latest in travel news, reward programs, and deals. The Points Guy Founder Brian Kelly became an expert in rewards because he traveled so much for business. By doing the dirty work of sorting through points systems and reviewing venues, The Points Guy can take the tediousness out of trip planning. The site also teaches travelers how to earn and manage their reward points, so they’ll have peace of mind in choosing the best experiences for the least amount of money. The articles and guides at The Points Guy don’t just teach travelers how to earn and use credit card points and rewards to their greatest advantage — they show how it can be fun. A quick look at The Points Guy’s Instagram account or videos of his recent adventures shows that Brian takes the time to enjoy himself as he works on finding the best travel deals — whether checking out a first-class flight or a 5-star resort. If you ever had a disastrous hotel or flight experience after booking it sight-unseen, you know how important it is to read in-depth reviews before choosing your travel service and accommodations – no matter how impressive they are at first glance. The Points Guy reviews page gives travelers access to detailed write-ups of popular flight and hotel deals, as well as user reviews of which credit cards offer the best travel points and rewards. You can either browse through the latest reviews or search by name for a particular service or card you’re interested in checking out. Hotel and flight reviews give travelers a preview of some of the world’s best destinations and ways to get there. These reviews are written by people who have personally used the services and include helpful details about how each deal’s rules and guidelines work, its pros and cons, and photos of the flight or hotel’s amenities. By offering travelers an inside look, The Points Guy’s reviews alleviate the dread of a vacation disaster. Travelers can then enjoy the planning process — and get what they bargained for. No matter what your knowledge level, you can learn something from The Points Guy’s guides section. If you’ve never used credit card rewards and travel points before, The Beginner’s Guide to Travel Points and Miles leads you through a 10-step process to getting started. You’ll learn how to open accounts with the airline or hotel loyalty programs you use the most so you can maximize your points. Since credit cards are the most popular way to earn travel rewards, The Points Guy also shares advice for choosing credit cards that fit your travel preferences. Through educational guides, The Points Guy educates everyone from a points novice to a rewards pro. For the seasoned traveler, the guide section can be a tool for comparing rewards programs such as Mid-Tier Elite Status on American, Delta, and United. In these more advanced guides, you can quickly scan comparison charts between rewards programs or read the breakdown for each program by categories like fees, discounts, and upgrade options. You can also find guides based on other criteria whether it is lifestyle (The Best Domestic Airlines for Families) or travel destination (TPG’s Guide to Tokyo, Japan). Whatever you’re looking to get out of your travel experience, there’s likely to be a guide on the site that covers it. Flight prices fluctuate seasonally, but there’s often a short window of time to react when prices fall. It’s especially hard to get a good deal when you’re trying to plan a trip at the last minute and need that window to be open right now. The Points Guy deals page alerts readers to daily insider scoops so they can snag the best current prices on flights and vacation packages, whether planning a trip for months down the road or throwing together plans for a last-minute getaway. The Points Guy deals page compiles many time-sensitive offers and last-minute fares that sell out quickly. Most of the daily deal alerts The Points Guy team posts are hotel deals or roundtrip flights from major cities to various destinations across the glob. You’ll also find an occasional contest, such as an opportunity to win a free helicopter flight. Within each listing, The Points Guy provides details about when and how to book, as well as tips for maximizing your rewards points by using specific credit cards. Scrolling through these alerts on a regular basis can help travelers find the right destination, at the right time and the best price. Successful vacations are built on difficult decisions — how to finance it, which rewards programs and credit cards offer the most points per dollar, and which travel and accommodation services you should use. Even after booking, there’s always the worry that you’ll get much less than you expected. With the help of Brian and The Points Guy team, these decisions can become easier, faster, and even fun. By reading reviews of flights and hotel venues, you’ll learn where to spend (and not spend) your hard-earned points for the best vacation experience. Through guides catered to your level of knowledge and travel needs, you’ll improve your understanding of how rewards and points work and which programs are the best for each situation. And with deal alerts, you can know when travel prices drop so you can maximize both your points and your money. The Points Guy’s mission to search out and share the best travel deals on the planet continues to yield rewards that go beyond miles or travel points. It’s wealth of articles, guides, reviews, and videos are educating and equipping readers to attain their travel dreams — and have fun in the process. Jon McDonald is a contributing editor at Digital Brands with over 15 years of experience editing, writing, and designing at numerous publications. His passions include keeping people informed about emerging trends and finding the latest companies making an impact on the financial industry. Away from the office, Jon enjoys grilling, watching sports, and spending time with his wife and two children.